When Internet popularity of Amazon and Alibaba are compared, Alibaba comes out as an obscure e-commerce outfit. If Alibaba were a country, it’s 1st day market cap would make it the 43rd largest country in the world – ahead of the GDP of 150 other countries. When market breadth leading up to $22 billion Alibaba IPO is examined, a market liquidity concern emerges. Quick. Name the Chinese company named after a folk hero from the Arabian Nights, which made history with the largest IPO ever on the largest stock exchange not only America, but also in the world. That’s just a rhetorical question. I am sure the world took a note of Alibaba (NYSE: BABA) in the last few days. Alibaba’s debut as a publicly traded company on NYSE is indeed a new world order in the world of finance. Wait, like many online shoppers in the USA, you too don’t know much about Alibaba? If you want to know more about Alibaba, the Company, Business Insider has a succinct summary of 22 Interesting Facts about Alibaba, the largest IPO in the US Stock market history, which can be read here. Founded in in 1994, Amazon (NASDAQ: AMZN) is only five years older than Alibaba and now Amazon is synonymous with e-commerce in the USA. In my social conversations with friends and colleagues, a recurring theme has been, “If Alibaba is such a big deal in e-commerce, how come we never heard of it?” It’s a very good question. Many articles have compared Amazon and Alibaba on e-commerce revenues and profits. You can find plenty of articles that present a rosy scenario for Alibaba and why it will be the first e-commerce site to become the 1st company to draw trillion-dollars in revenues. Sure, that would be a very impressive feat and I won’t question or challenge such assessments. However, I am more hung up on a different theme altogether. 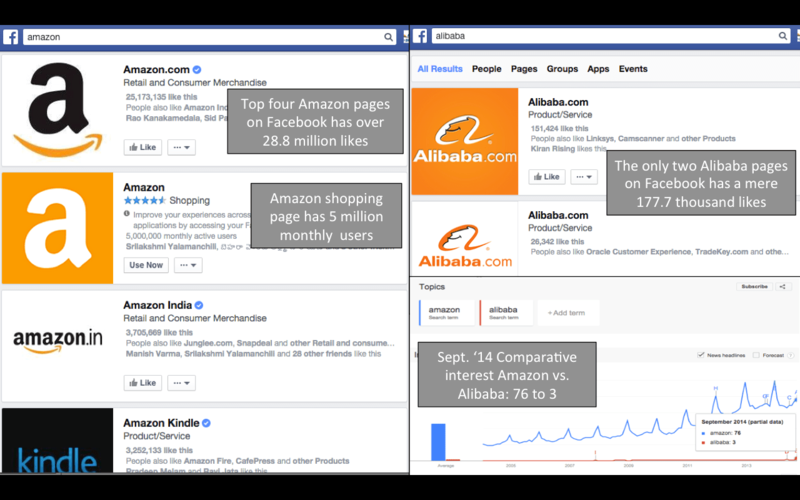 So, I tried to do a comparative assessment of Internet popularity of Amazon and Alibaba – on social media and search popularity. The following two exhibits show the comparison. As exhibits 1 and 2 illustrate, when compared to the e-commerce pioneer Amazon, Alibaba is not even in the little league. No wonder very few people (at least in the USA) have heard of Alibaba. This is not to say Alibaba is not popular in other parts of the world. Rather, If find it very odd that a much ballyhooed e-commerce giant of company has relatively such a small footprint on the Internet. If nothing else, Alibaba may have a lot of catching up to do in the Internet popularity department. Major IPOs with huge fanfare like that of ‎Google (NASDAQ: GOOG), Facebook (NASDAQ: FB), Twitter (NASDAQ: TWTR) and now Alibaba come once in a 3-5 years. The investment interest in these mega issues is so big that their market caps and the dollar volume of trading in those stocks far exceed the annual GDPs of many countries. The hype and risk appetite surrounding these stocks give an insight, albeit anecdotal, into the market sentiment. I would like to attempt to make some sense of what appeared like an utter frenzy in the markets surrounding the IPO of Alibaba. Valued above some of the 100-yr old and other veteran institutions such as Proctor and Gamble, JP Morgan Chase, IBM and Toyota; and the recent /tech stalwarts like Facebook, Intel, Oracle, Verizon, AT&T. If Alibaba were a country, it’s 1st day market cap would make it the 43rd largest country in the world – ahead of the GDP of 150 other countries in the world (greater than the GDPs of Pakistan, New Zealand etc). Its market cap is only $30 billion shy of the GDP of Hong Kong, where Alibaba does a lot of business. Jack Ma, Alibaba’s founder, has a net worth of $10 billion. That makes him the eighth richest person in China. The size of Alibaba IPO was $22 billion. On the 1st day of trading alone, about $24 billion worth of BABA shares were traded, which indicates a good possibility that a major chunk of the shares allocated at the IPO have already changed hands. On the Alibaba IPO day, though DOW closed at a new record, it is fair the markets were essentially flat. I believe that these numbers have significant bearing on market liquidity. Before talking about the indications from trading in BABA as a reflection on market liquidity, I want to put market liquidity in some perspective. For many months during the current Quantitative Easing period (QE3), the Fed injected into the markets about $4.0 billion per day via bond buying ($85 billion per month). In December 2013 the Fed, under the then Chairman Ben Bernanke, began tapering QE3 with monthly reduction in bond purchases. After the FMOC meeting on Sept. 17th, the Fed announced the latest round of reduction in monthly bond buying by another $10 billion for Oct. 2014, which leaves the monthly QE3 at $15 billion. The Fed is on track to eliminate QE3 by end of 2014 and begin tightening in the spring of 2015. The Taper, in part, is supposed to drain excess liquidity. Throughout the peak-QE3 period ($85 billion per month), the liquidity spigots had very little effect on the economy but propelled the US and major European stock indexes unprecedented heights without any significant correction. Even after the Taper began, all through 2014 major market indices have charged ahead with new highs after new highs. Underneath the headlines of new market highs, all through the QE3 and the Taper the market breadth has suffered. The following chart shows the rise in S&P 500 vis-à-vis the market-breadth indicated by percentage of stocks trading over the 200-day moving average. While the S&P 500 and Dow 30 are at record highs, small stocks as indicated by Russell 2000 index have not participated in the rally since March 2014. As seen in the chart above, the Russell 2000 index not only sold off big on the day of Alibaba IPO, it is also very close to making the so called “Death-cross” (50 DMA crossing 200 DMA from above). 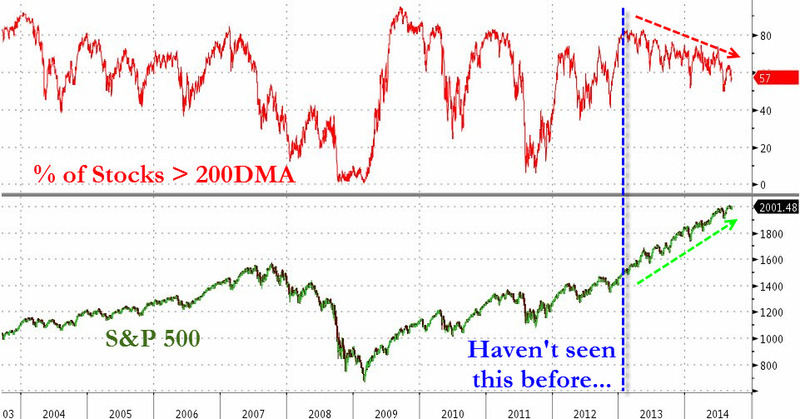 The last time this happened was in August 2011 around the S&P downgrade of US debt. One of the observations that can be from these two charts is, there isn’t enough liquidity to go around to lift all boats at the same time. Therefore many stocks are being liquidated to buy fewer and fewer large- and mega-cap stocks. Coming back to Alibaba, here is a succinct summary of dollar volume traded in Alibaba on the 1st day (hat tip to Eric Hunsader of Nanex). Imagine that – just ONE stock represented 19% of the daily dollar volume on the largest exchange in the world! The 24 billion dollar volume of trading on day 1 is equivalent to eight days at the Fed’s liquidity pump at the peak of QE3. Though markets are still amply liquid, the underlying trends are indicating a steady decline. Also, it is not a stretch to extrapolate this data to infer that – in order to buy / trade Alibaba the market participants sold a lot of other stocks, presumably underperformers. This reminds me of a 1992 Ross Perot quote, “Giant sucking sound from the South” (in reference to NAFTA). It feels to me like Alibaba is a giant sucking sound of market liquidity. Even if Alibaba can and will live up to all the hype, the manic frenzy surrounding BABA makes you want to pause and absorb what it could mean to financial markets going forward. Nobody rings a bell at market tops. Anecdotal evidence of market tops is usually spotted in the rear-view mirror. 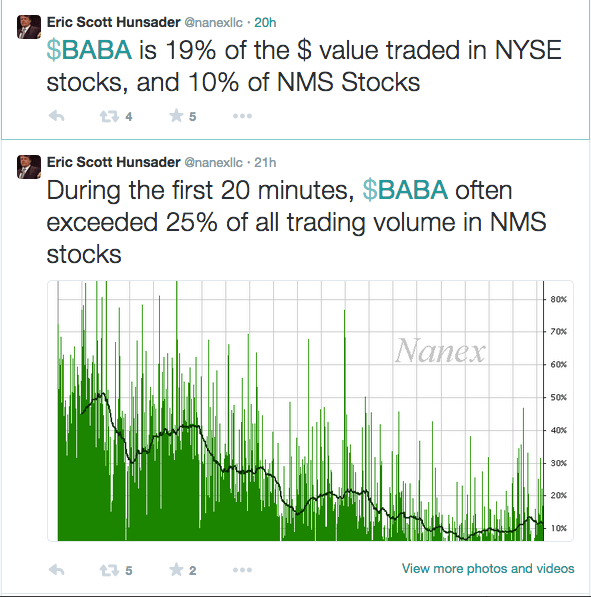 In years to come the BABA-frenzy could likely be seen as a sign of market top. Then again – the central bankers the guardians of banks and financial market have telegraphed enough times that they will print as much money as the markets demand. It’s going to matter until it doesn’t matter. The $4 trillion question is, when will this insanity end?